Driving during rush hour is terrible. You're always in the slow lane, and when you finally maneuver into the fast lane it inevitably slows down, and your air conditioner is broken and you can't find a radio station not playing that damn LMFAO song with the "Wiggle Wiggle Wiggle" thing. And you just want to smash your forehead through the windshield, strip off your shirt, run free into a shaded forest and feel the cool air on your chest, and escape the rat race and the traffic of the godforsaken pavement forever. Sure, we've all had that exact feeling. And, alas, there is very little that technology can (legally) do to clear the highway of cars (for now). But the makers of the innovative navigation app Waze think they've come up with a better way to help you both avoid crippling road rage and cut some time off your commute, all with a little help from the kindly drivers around you. Here's how Waze works: Like many other navigation apps, Waze (free on iOS, Android and BlackBerry) offers turn-by-turn directions and routes that automatically refresh based on changing traffic conditions -- that's the basic stuff. Uniquely, however, Waze users can also manually send in traffic updates that appear as pop-up alerts to fellow drivers. So, if you're driving along I-9, and a driver two miles ahead of you on I-9 notices a speed trap, he can tell Waze, and Waze will tell you, creating a pop-up notification. From the app, Wazers can report anything that might cause a slowdown in traffic -- accidents, traffic jams, speed traps, construction, adorable sloths crossing the street -- to help make their fellow drivers on the road more aware of what they're approaching, and how they should react if they want to get to their destination on time. "When you're using Waze, you're not driving blind; there's no reason to drive like that anymore," Waze Director of Communications Michal Habdank-Kolaczkowski told HuffPost. "You may have four ways to get into work, and you may have your best guess as to what the best way is to go. But there's no real way to know. The only way to know is to ask your neighbor or co-worker how the roads are. We take that question and try to make it social through a mobile application." At its core, Waze functions like many other GPS systems. After you input your starting point and destination, the app maps out your fastest route, based on how quickly other drivers are traveling along the roads you could potentially take. Waze begins to separate itself from its competitors, however, with the add-ons it delivers for free. Unlike the Maps application that comes bundled with both the iPhone and Android phones, Waze can both speak out directions as you approach turns, on-ramps and off-ramps, and update your directions automatically as traffic changes along your route. That is, if you're set to get onto I-9 in five minutes, and all of a sudden a tractor-trailer flips over on I-9, then Waze will pipe up with its little robot voice and steer your clear of I-9. "We are starting to replace traditional road sensors and using real human sensors," Habdank-Kolaczkowski said. "It just takes a little participation [from our users]. 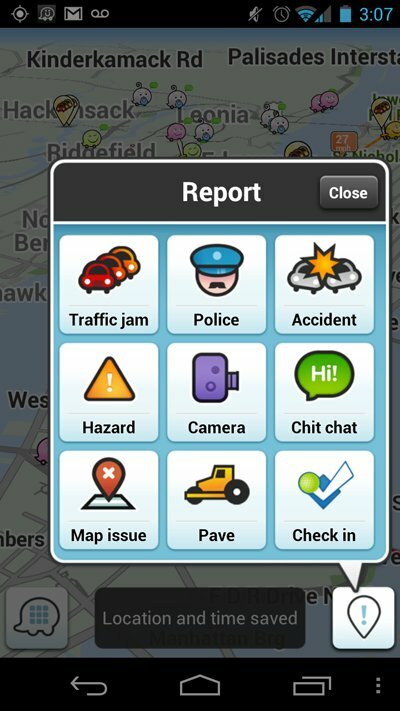 That's the biggest thing about Waze to date that we're really proud of." Obviously, these Waze driver reports are only effective if there are a lot of Waze drivers, on every road in every state. Though Habdank-Kolaczkowski said that 20 percent of Israeli commuters use Waze every day (it's an Israeli-based company), it is not so clear how many American users are, and how much more helpful Waze will be than a native GPS app on roads with few Waze users. Waze estimates its active global users at 12 million -- it has appeared in the Top 20 most downloaded free apps in the iTunes store (right behind Twitter, at one point) and often rotates with TeleNav as the most downloaded navigation app. Here in New York City, the app was buzzing with reports of slowdowns all over the metro area on a Tuesday evening, with about 400 active drivers in Manhattan using Waze at 5PM. Those numbers are impressive, though Habdank-Kolcazkowski indicated that New York City was a hotbed of early Waze adoption. To encourage more downloads -- and also more participation from solo drivers -- Waze has outed a neat touch-free feature that will allow users to report incidents by waving a hand over the iPhone screen and speaking to their smartphones. Waze is certainly not for everyone. It is questionable how safe it is for certain drivers (::coughMYMOMcough::) to regularly interact with their smartphones while behind the wheel, whether they are touching the screen or not. In January 2010, the National Safety Council famously reported that in 2009 there were 1.6 million accidents due to "cellphone use." An app that encourages cellphone use in the car -- no matter how ingeniously it circumvents normal smartphone interaction -- is sure to raise the hackles of those who want that kind of interaction banned. And yet the idea behind Waze -- that a car in front of you in a traffic jam can communicate with you, let you know which lane is blocked, which lanes are moving quickest, how much progress is being made in clearing the jam -- should be enticing enough for many frustrated commuters to give it a go. Before you rip off that shirt and run screaming into the forest, try Waze, and get some help from other drivers who were once jammed, frustrated, and angrily wiggling in the driver's seat just like you.